First, Roe and the companion case Doe v. Bolton (decided on the same day) legalized abortion in every trimester of pregnancy. Second, if the Court overrules Roe, it simply goes back to the states to decide, like it was prior to 1973. The way a poll phrases a question (or in this case, an answer option) can impact the results substantially, especially on abortion. In 2013, Pew Research Center found that a majority of young adults (57%) between the ages of 18 and 29 don’t even know what Roe v. Wade is. 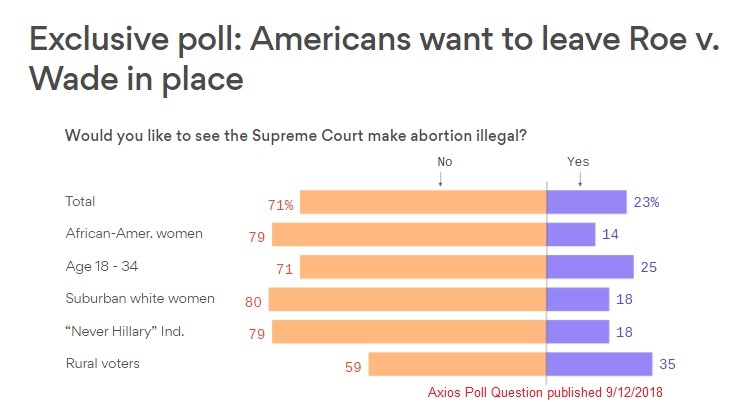 Axios’ improperly worded question led those polled to believe abortion would automatically become illegal if Roe was overturned, rather than being left up to states to make their own laws. It resulted in 71 percent of respondents claiming that they didn’t want Roe overturned. Naturally, abortion supporters were elated. Axios Editor-in-Chief Nick Johnston told DailyMail.com on Wednesday that his organization would be revising its conclusions. ‘That question was not worded well and we missed it,’ Johnston said in an email about the mistake. 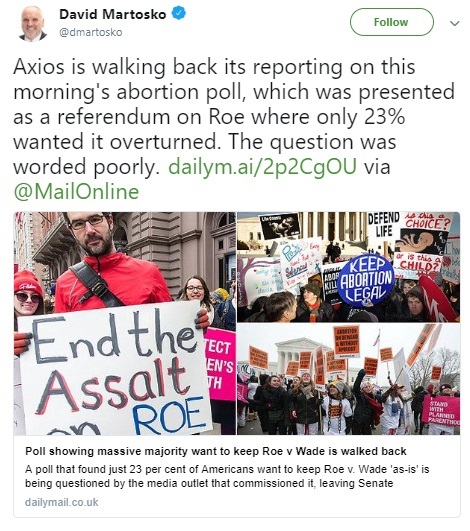 But The Daily Mail called Axios out again, noting, “That means that in order for 71 per cent to believe Roe should be left ‘as is,’ more than half of pro-life Americans would have to agree.” And obviously, that’s not the case, making the poll completely unreliable. 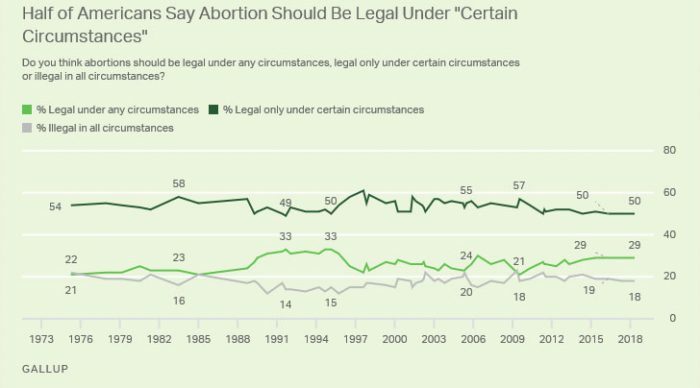 Live Action News reported on a June 2018 Gallup poll, which found that 43% of Americans feel abortion should be legal in all (29%) or most (14%) circumstances, while a majority of 53% say it should be legal in only a few (35%) or no circumstances (18%). Other polls reviewed by Live Action News give similar results. This month, Life News reported on a new poll that showed a small percentage of Americans want abortion legal under all circumstances. 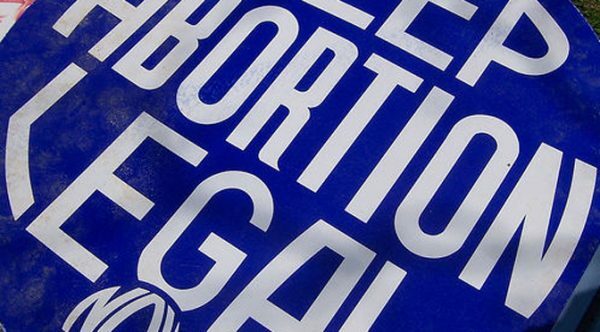 “The American Barometer poll for The Hill found that 55 percent of Americans think abortions should be illegal in all or most cases, while just 18 percent think it should be legal for any reason up to birth,” Life News wrote.